​Its kind of funny but I was reluctant to write anything on this 9/23/17 sign since everyone was already doing it. But I think its time now being that soooo many people are saying its the “rapture” date but still beating around the bush just in case its not. Well let me say this first. Its not the date of the “rapture” of the Church. Jesus comes back one time and to say He comes back more them once at the END is just being disingenuous with Scripture. When 9/24/17 hits the calender we will all still be here not unless of course you have went home to be with the Lord Jesus in a more natural kind of way. Now as you can see, I don’t see this as any rapture date or as a good sign for that much. I see this sign in the heavens as a FALSE sign. What do I mean by that? Well first off this sign happened at the birth of Jesus. Not all of Revelation (or Rev 12 for that matter) happened in the past because we are still waiting for a few things to come to pass in an eschatological sense. I think that’s obvious. But this sign mentioned in Rev 12 admit the woman giving birth to the male child is in fact Jesus. Not one time in scripture is the Church or should I say Ekklesia mention as a male child being caught up or harpazdo to Heaven. In fact, the Ekklesia is mentioned as just the opposite. We are mentioned as the body of Christ where Jesus is the head. We are mentioned as the Bride of Christ, to our Bridegroom. This is feminine not masculine. So this sign in Rev 12 makes absolutely no mention of the ekklesia anywhere. Now its being tagged as the sign that hasn’t happened in 7,000 years. Well that’s not exactly true. Jupiter the King planet actually has an 11 year cycle where it goes into Virgo for a period of time. I will say that this 9/23 sign is unique in its own way but it isn’t exactly following a Biblical mandate. Especially if its talking about the birth of Jesus (which it was) and He was already born. That should tell you that this specific part has come to pass. (And I still hold to the Sept 11, 3 BC date for the birth of Jesus, in which this sign originally appeared.) But trust me, that won’t stop the enemy from playing their game of deception and fooling alot, and I mean alot, of Christians. Its all about deception and this is what we are seeing. The enemy will invert and twist scripture just to add a little chaos to the situation. Now another problem with this sign is that the woman has a crown over her head. Well the most popular theory is that this crown of 12 stars is actually the constellation Leo the lion with the addition of Mercury, Mars and Venus. Since when did a Lion and three planets all of the sudden become a crown? Since never that’s when. 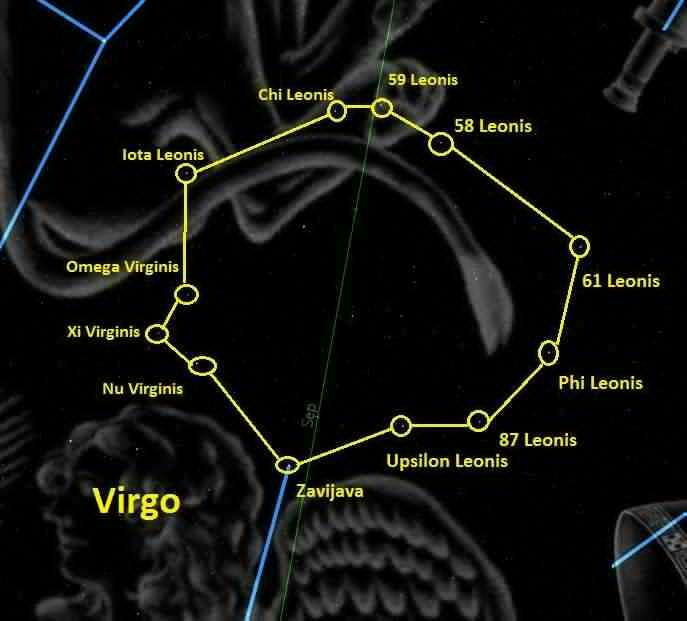 Now there is actually a crown above Virgo’s head that has 12 stars and is called the Virgo cluster. Its also known as the constellation “Coma Berenices”. And once again, this showed up perfectly on 3 BC at the birth of Jesus. 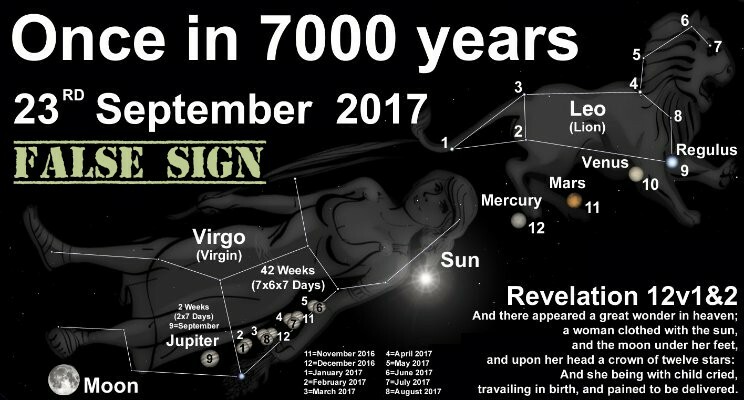 But for some reason people want to disregard the actual crown connected to Virgo and say that its actually Leo and three planets that have become this crown for this 9/23 sign. Now don’t get me wrong. This false sign still has a ton of implications but they are all bad. Jewish rabbis are expecting their messiah to show up sometime in 5778. I have shown you where a Rabbi predicted how the UN would come against the land of Israel to divide it and if it was fine by a certain time, it would welcome in there “messiah”. This would then lead to meteors fallong at an alarming rate. This has all come to pass. Are we to listen to what a Jewish Rabbi predicted? Not necessarily but its very interesting that everything is falling into place. I believe this is a false sign with very negative connotations. Do I believe someone will literally be born on 9/23? No I don’t. What I believe is happening is of spiritual significance. I personally think that Satan and this Antichrist spirit could influence this man of sin and put it in his heart to fulfill Gods will. I see this same thing happening with what happened with Judas in John 13:2. I do want to point out that the KJV translated this as “having now put into the heart of Judas” which I believe isn’t a good choice of words in English. I think a better translation is “having already put into the heart of Judas” and this word put could be translated as cast or “give motion to, not with force yet with attention and for a purpose”. Another form of this word is used in Revelation for Satan being cast into the pit and a 1/3 of the stars cast out of heaven. Let me add one last thing about this sign. 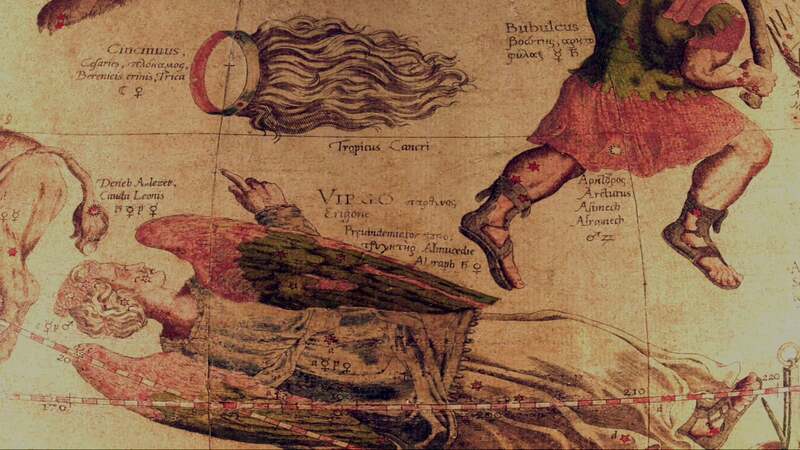 Some point out that Jupiter actually leaves the “womb” of Virgo earlier than 9/23. It actually does leave the womb on 9/9/17 but I found Isaiah 66:7-8 very interesting in this context. ” Before she travailed, she brought forth; before her pain came, she was delivered of a man child. Who hath heard such a thing? who hath seen such things? Shall the earth be made to bring forth in one day? or shall a nation be born at once? for as soon as Zion travailed, she brought forth her children. Shall I bring to the birth, and not cause to bring forth? saith the LORD: shall I cause to bring forth, and shut the womb? saith thy God”. We know this is about the Messiah being birthed from the nation of Israel but I find it interesting in context with a birth before travail. If we take everything into account that we have already seen since December of 2016, then we know there is some bad things coming in the future. Another sign I mention in the near future is Saturn leaving the restrainer (Ophiuchus) on November 18th 2017. Is this connected to this false birthing sign and is this reminiscent of Judas taking the sop and being indwelled with Satan (John 13:27)? And i suggest you refer back to my study on the restrainer in 2nd Thessalonians here (https://m.facebook.com/story.php?story_fbid=1097645790344972&id=519754571467433). To shut the womb or make barren in Hebrew is literally to restrain. And in this case, when the restraint is gone, it opens up the womb for something to be birthed. Do you understand what I’m getting at? So with everything we already know, is this 3rd day of 5778 that just happens to fall on September 23rd, 2017 really a good sign? Or is something being birthed and being taken out of the way so this man of sin can be indwelled with Satan who will have but a short time.